Andrea Wallace is the Director of Artistic Programs and the Director of Photography and New Media at Anderson Ranch Arts Center. She received her MFA from the University of Colorado at Boulder. Before coming to the Ranch, she worked as Assistant Professor at Lake Forest College and Willamette University. Her film, Rochell and Brian, a documentary about teenage pregnancy, premiered at the New York International Independent Film Festival. She exhibits nationally and internationally with numerous shows throughout the Americas, Europe, China and the Middle East. Jess T. Dugan: Hello Andrea! Thank you so much for talking with me today. Let’s start at the beginning: what drew you to photography and what was your path to getting to where you are today? Andrea Wallace: The family album was the basis for my early interest in the photographic image. As a child, I spent hours looking at images of ancestors in old albums with a sense of longing – longing for a connection to a time and to people that had passed. I tried to connect stories about these people, how they lived, who they loved and how they died through their image. The ability of a photograph to capture an instant and protect it from the supersession of time has always intrigued me, even before I could articulate it. For me there is always a longing in photographing something, perhaps a desire to possess it and in doing so, better understand a version of it. My mother said that I talked about being a photographer from an early age. I got a camera when I was ten and always took the family pictures on holidays and vacations. I studied photography in college in a very technical program where I learned how to make images and understand light. 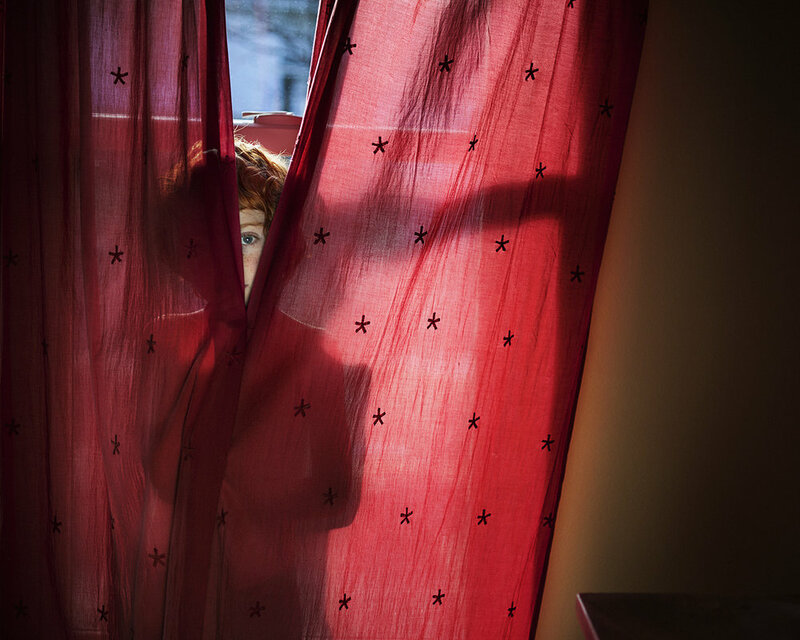 I worked for a while in photojournalism and realized that I wanted more time with my subjects and their stories and decided to move toward long-form documentary and narrative based photography to tell stories about people that often mirrored my own. 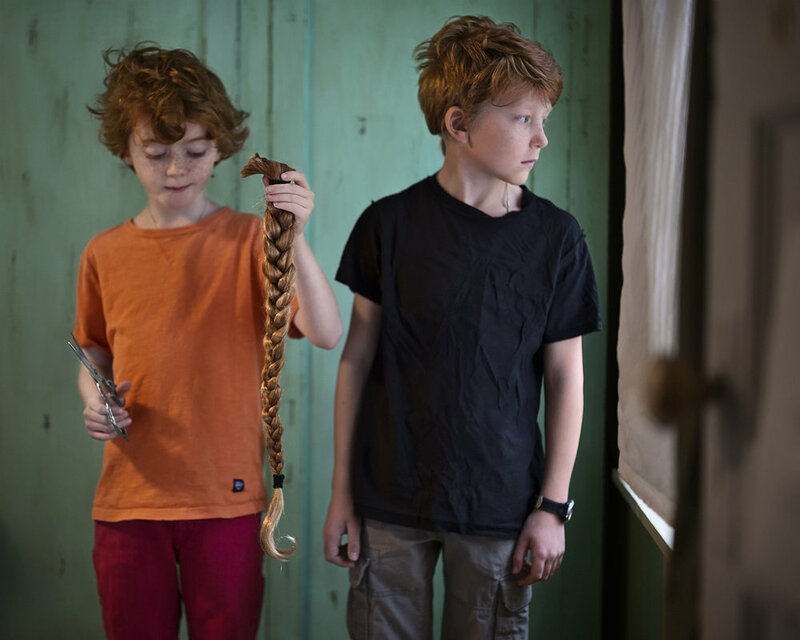 JTD: You have an ongoing series, Frères, of portraits of your son, Beau, with his friend Nicolai. How did this project come about? What stage is it currently in? I’m also interested in your thoughts about masculinity. Both Beau and Nikolai possess a gentleness and almost a slight androgyny. Is this something you’re thinking about consciously in this work, or is it something that just happens to be a part of it? AW: The exploration of boys and masculinity is a thread through many projects. I didn’t know my father and was raised by two strong women. I was made fun of as a child for being a “tomboy” and not fitting the mold of what a girl should look like or be. When my son was born, I became more acutely aware of masculine gender stereotypes and roles as many people had strong opinions about how I should dress him, talk to him and raise him – even when he was still an infant. I began a portrait and video project on Eagle Scouts which explored the paramilitaristic overtones of scouting in the ways young boys are dressed, the pledges, oaths, badges and overall culture of scouting. As I worked on the scout project, I saw that my young son and his best friend Nico exhibited a fluidity in their gender with Nico at the time often being mistaken for a girl with long hair and a braid, their soft bodies and tenderness toward each other. Overtime, as they have grown, their movement toward masculinity has become more apparent and this is something I wanted to photograph. Nicolai’s father was an Army Ranger and one can see how he has grown to emulate of his father in his military dress, dog tags and overall stance. Beau is younger and still presents himself with what one might call less masculine affects. As teenagers, the way they interact has changed just as they become more indoctrinated with gender roles. I see this project continuing until they are 18. I think the individual images are interesting, but it’s when the project is viewed in entirety that the layers of meaning are accessible. JTD: What is your experience like making work with your son? To what extent is he a collaborator in the image-making process? How do you navigate issues of consent, interest, and participation? AW: The experience of making work with Beau has been two-fold. I have strong ideas about what kind of images I want to make, but Beau is a collaborator in that he often suggests changes or just doesn’t want to make an image on any given day. That is the hardest part for me, when there are times that I think it would be perfect to capture something he is doing, or the light is just right and yet, he is unwilling to pose. It is something we both navigate and negotiate on an ongoing basis. As the boys get older, they are less willing to participate and I spend considerable time explaining how important it is that we don’t go too long between photographs as they are physically changing so fast. But then it becomes more about me than about them, and they remind me of that. It’s an ongoing challenge. JTD: You have another series, Towards Amnesia, that includes portraits of yourself. Tell me about this project and how it came to be. Do you view this series as being in dialogue with Frères? What would you identify as the through line that connects your various projects? AW: The Toward Amnesia project came out of a very difficult time in my life when I was going through the ending of a relationship. I read a book by the same name about a woman who was ending a relationship and wanted to bring on my own amnesia in order to forget. I read about a sort of amnesia called retrograde amnesia that comes from sudden immersion in cold water. I started to take cold showers and submerse myself in mountain lakes and to make images. The image Sleep 2013 speaks to this process as much as to the intensity of the mental anguish I was in – the fetal position, wanting to just go to sleep and forget everything and the snow, the cold. As time went on, I started to also photograph that which I was connected to, that which was the thread keeping me here. Those images were those of my son, Nicolai, and friends. I was trying to talk about longing and connection, about loss and hope. And out of that project emerged Frères, where I focus on the connection of Beau and Nicolai. JTD: In addition to being a photographer, you are Interim Director of Programs and Director of Photography and New Media at the Anderson Ranch Arts Center in Snowmass Village, CO, where you have been for many years. Tell me about this aspect of your life. In what ways does your role at Anderson Ranch influence your work as a photographer? AW: The role of Director of Photography and Artistic Programing at Anderson Ranch directly influences my work. As I am in constant contact with artists and colleagues with fresh perspectives, I gain a direct understanding of their processes and content. My job at the ranch is intense and requires a lot of energy and focus so sometimes there is little left for my own practice. I think this is common for many artists and it’s about committing to a practice and carving out time for it. The ranch affords me the opportunity to be in a place where the best thinkers and makers come through. I gain access to artists I wouldn’t have otherwise and many have become friends with whom I can discuss ideas and get critical feedback. It’s truly an inspiring place and art is always on my mind, whether it’s in programming workshops, interacting with visiting artists and critics, or just conversation in my own studio. Art is at the forefront of my daily life in a way that wouldn’t be possible if I were living elsewhere. JTD: As you mentioned, through your work at the ranch, you have met hundreds of photographers and artists. Who are some of the artists who have influenced you the most? AW: There are many people who have influenced me: photographers, painters and artists with a complete dedication to practice. Artists who have influenced how I think about work and my own practice include people like Cathy Opie, Alec Soth, Elinor Carucci, Richard Rinaldi, Doran Langberg, Mickalene Thomas, David Hilliard, Jess Dugan, Mona Kuhn, Richard Learoyd, Rineke Dijkstra, Zanele Muholi and clearly, Sally Mann. JTD: What are you currently working on, and what’s on the horizon? AW: I am currently working on a new project in Scotland focusing on portraits of boys who are bagpipers in the northern highlands. This portrait project explores adolescent boys and their relationships to masculinity, bagpiping, and the history of Scottish culture.